Sorry for the scrunched-up images, but here are two shots of the path I'll be walking. These are for Day 1 and Day 2, but just reverse them in your mind for Day 3 and Day 4. 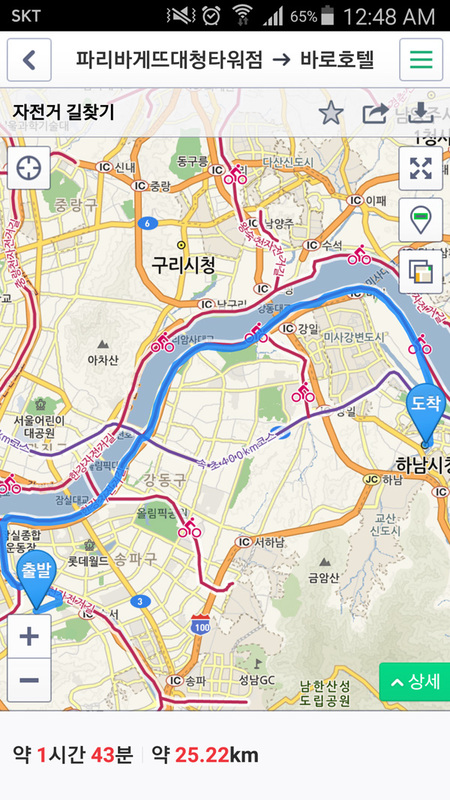 My paths are highlighted in blue; read them from left to right, as I'll initially be traveling eastward before turning around and marching back to Seoul. All told, that's a 119.7-kilometer walk, just 300 meters short of an even 120. I might do a loop around the park next to my apartment just to put me over the top. We'll see. If my feet are in too much pain, I might not be in a state where I care that much about 300 meters. My phone is acting up, so I'm not sure how I'll handle the uploading of photos along the route. I might end up not uploading any photos because, for some reason, my Blogger app is now rotating photos 90 degrees to the right if the original image is in portrait alignment. I haven't checked to see what happens to landscape photos, but I'm not a fan of uploading landscape pics because they end so shrunken that you have to squint to see what's going on. Anyway, I'll figure something out, and if worse comes to worst, I'll be back at my place on Tuesday and still on vacation on Wednesday (Happy Lunar New Year, all and sundry: it's the Year of the Golden Pig! ), so I can email pics to myself, run them through Photoshop, and slap them all up then. One way or another, by hook or by crook, There Will Be Photos. Wish me luck. I doubt I'll blog again until I've reached my first hotel.